Have you ever been disappointed after taking your dog to the vet? Maybe you felt like you didn’t get the level of care you expected or you were confused about a diagnosis or treatment plan. Maybe your concerns weren’t fully acknowledged or addressed. A few months ago I wrote 10 Ways to Find a Good Vet for Your Dog but that’s only half of the equation. You and your vet work as a team to keep your dog happy and healthy so today’s post addresses your role in helping to make vet visits productive. Check out the following tips to find out what you can do before, during and after your appointment to ensure you’re making the most of your pup’s next visit to the vet. Let’s face it, there are a lot of things we need to keep track of these days and it’s easy to forget what and when certain treatments or vaccinations were given. 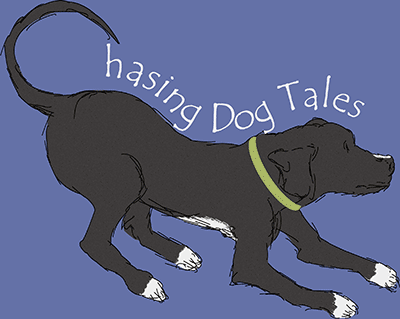 Download a smartphone app or buy a cute, little notebook to record a medical journal for your pup. 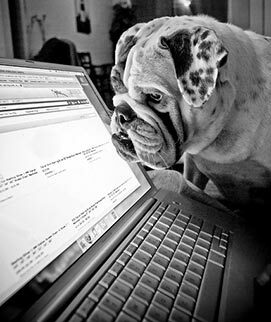 Update it each time you visit the vet and add any health related notes that come up between vet visits. Take it along with you during appointments and you’ll have the information at your fingertips if it’s needed. I’m a big believer of being informed and knowledgeable about health related issues that might affect Haley, but I’m also cautious about taking advice or using the internet to diagnose ailments. Always keep an open mind and consider your vet to be your ally and partner in keeping your dog healthy. Trust your gut instinct instead of waiting until your dog is really sick before heading to the vet. Don’t drop in without an appointment unless it’s an emergency and even then, try to call ahead to let them know you’re coming. If you have several issues to discuss during your visit, try to make an early morning appointment since some offices may run behind schedule late in the day. Have you ever left the vet’s office then realized you forgot to bring something up? It’s easy to get distracted while trying to keep your dog calm and talk to the vet so don’t feel silly about making and referring to a list of questions and concerns. I once found a lump on Haley the very next day after a vet appointment to aspirate a different lump. I now inspect her regularly and before every appointment just in case there’s something else that needs to be checked out. Also, monitor and note any changes in behavior that could point to a medical problem so you can relay that information to your vet. 6. What to Take (and not take) Along. Make sure you remember your medical journal, any requested specimens (urine, stool samples, etc.) and maybe a few treats to reward your pup when the exam is over. Don’t have someone else take your dog unless they know all of your dog’s health details and can answer questions and approve treatment. Also, don’t try to sneak in extra pets for an exam unless they have an appointment too. This should be common sense and common courtesy but many vets complain about clients being late and putting them behind schedule. Arriving late might mean your dog’s time with the vet could be cut short as well as clients that are scheduled after your appointment. Be considerate of the vet, staff and other clients by arriving on time. While waiting to see the vet, be considerate of other people and their pets by keeping your pup close to you and under your control. Avoid stressing out other pets that could be ill or injured by giving them plenty of space. Vet visits can be stressful for you and your pet. Just walking into the office makes some pets tremble with fear and there’s a good chance you might be stressed about your pup’s health, as well as how much the treatment might cost. Since dogs often pick up on our energy, try to stay calm. I know it’s not always easy, but taking a few deep breaths can really help. Everyone’s time is valuable so make the most of your visit by giving your vet your full attention. It’s hard to believe, but some people actually answer or talk on their cell phones during an appointment. Turn off or ignore your phone and make your dog’s health a priority. You know your dog best and your vet relies on you to clearly communicate symptoms, concerns and other relevant information about your pup. Refer to your notes if you have multiple issues and be clear about your expectations, whether medical or financial. Fibbing or stretching the truth about things that affect your dog’s health can be harmful and can prevent your dog from getting proper treatment. Be honest, even if it might be embarrassing. Also, be sure to let your vet and staff members know if your dog has been aggressive in the past. If you’re confused about something or are unsure about the suggested treatment, be sure to speak up. Veterinarians would rather you ask than have you walk away confused or walk away in search of a new vet. Don’t hesitate to ask your vet to repeat something you didn’t hear clearly, it’s better to be safe than sorry. The moment Haley steps outside the exam room, she shakes it off, her tail starts wagging and she looks at me with a huge “Whew, it’s over!” grin, then she gets lots of praise and those treats I brought along. It’s probably not your favorite part of the visit, but while paying your bill you’ll also receive any needed medication and additional instructions. This is a good time to ask any last minute questions and pick up specimen bottles if you need to bring in a urine or stool sample during your next visit. Remember that cute, little journal I mentioned? When you get home, update it with the date and details of the appointment along with any observations or additional information. It’s good to do this right away while everything is still fresh in your mind. Follow your vet’s instructions or schedule for giving medication and don’t be afraid to call the office if you have any questions or concerns after your appointment. If your vet mentioned your pup needs to lose a few pounds or exercise more, make the effort and follow through to keep your dog fit and healthy. 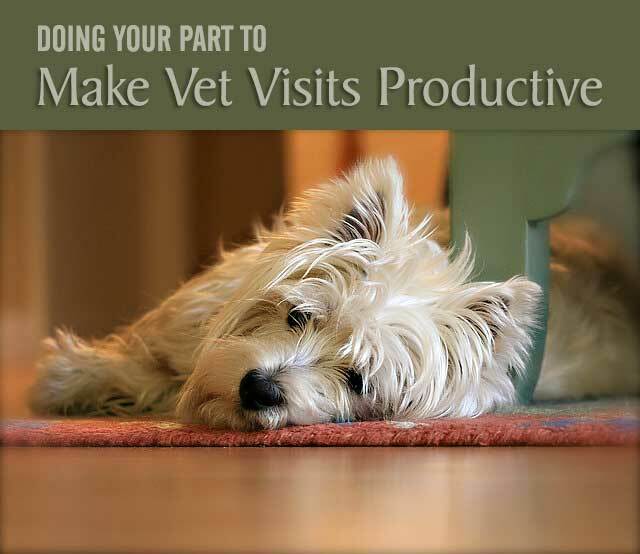 Remember, you have a big role in helping to make vet visits productive. By working as a partner with your vet, you can ensure the best quality of care and improve the overall health of your dog. 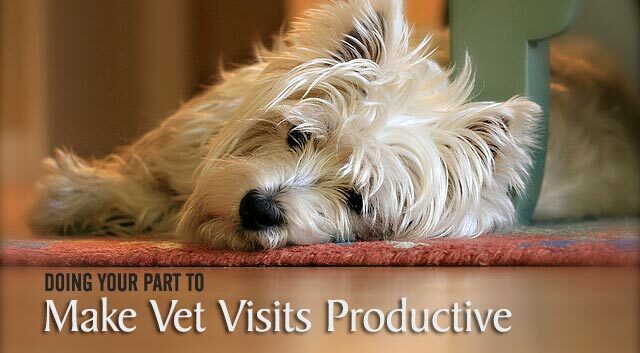 Now, I’d love to hear your ideas and tips on how to make vet visits less stressful and more productive! Great tip on treating a nervous dog. I’ve always thought about giving treats before or maybe even during an exam, but thought maybe crumbs or pieces would get stuck in her mouth or gums right before the vet would be checking out her teeth. I really should ask next time if it matters since it’s not a full dental exam she’s getting. These are all such important tips. I always bring a list of questions and if it is something that Bentley is doing that is out of the ordinary, I video it to show my vet. I LOVE that idea, MK! ?Sometimes I forget that I can just take a picture or video to make notes. Mom always brings her list along or she forgets to ask stuff. Since we all go together it can get chaotic at times but with the list, no problem. I bet! I have forgotten things with just one dog, I would definitely need a list with multiple dogs. I especially appreciate point #4 under things to do after your visit- it’s essential to follow-up on what your vet tells you to do. Not doing so is a big cause of additional bills and extra visits that could have been avoided! Yes, whether it’s making sure your dog rests and takes it easy or making sure they get all the antibiotics, etc., you have to follow through. Thanks for stopping by today, Marco! ? These are amazing lists and very informative for us as Rae is our first pup. We will definitely keep these in mind next visit and to stay proactive about her health! Thanks Reagan, You guys are doing an amazing job in getting Rae started off on the right foot, I mean “paw”! Good points. I write down all my questions because of course Cocoa is going to be bouncing around and I would forget. It is a partnership with your vet for sure. It is so important to find someone you and your pup feel comfortable with. That’s such a good point, Julie. You might have to try a few different vets until you find the one you’re comfortable with and one who will work as a partner if you have concerns about vaccinations, medications or treatments. Kilo hates the vet and can be a bit reactive and anxious, so I really have to be prepared and make the most of the visit. Thanks for the tips. You’re quite welcome and I hope the tips come in handy. 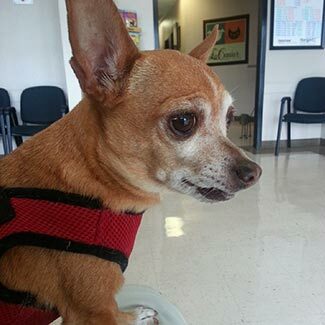 Kilo’s definitely not alone in hating vet visits, lol! Great post! Really like Number 1 and 4 under ‘Before Your Visit’ – I do try to make a list of questions but keeping a medical journal will take care of that as well as so much more! 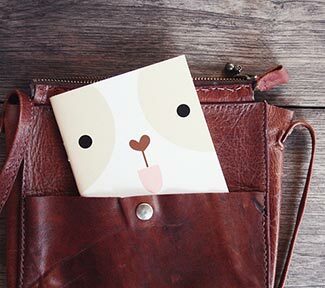 Great idea (and a good excuse to buy a ‘cute little notebook’). Thanks, Teresa! Having that journal has helped me so many times. For example, Haley’s had bad reactions to vaccinations and medications in the past, so it’s nice to have those notes handy when the vet need to prescribe medication. Great suggestions. Tim is due for a check-up and I’m going to make use of some of these tips! Great, Vicki! I’m glad they were helpful and I hope Tim has an excellent checkup. ? I like your tip about writing down questions ahead of time. I try to do this sometimes, because I tend to get in there and then forget everything. If I have my questions or concerns written down, then I can quickly glance at it to make sure I didn’t miss anything. Yeah, I had to learn this the hard way after a few appointments when I forgot things. It’s not always easy to bring up or explain issues over the phone after the fact and I’m sure the vets find that aggravating too. I have to bring a list of taking points to the vet during sick appointments because I forget so many things once we are there. Also, if your dog is squirmy or fear aggressive it definitely helps to take photos ahead of time. Rosie had some growths/hair loss last year that she did not want the vet touching (turned out to be bee stings) but with the photos the vet was able to spend less time examining her. That’s a fantastic idea of taking photos for dogs that get tense or fearful. I just realized another great way to use photos would be to document a rash or bump, in case it changes before you can see the vet. I can’t tell you how many times I’ve referred to Haley’s journal, it’s so easy to forget all those details after a number of years. I use a section of the journal to record information about when Haley’s allergies act up which is helpful when trying to narrow down the source of her allergies. I try to keep a list of questions too or I forget. Mr. N is going to the vet next week, I’ll have a long list! That’s great! I’m sure your vet and staff appreciate that you’re on top of things and organized. ? I hope Mr. N has a great checkup. This is such a great list! I’d add just one slight thing. When my pets are super-duper ill and I know I’ll have a lot to discuss (happened to me this week, in fact), I’m up front about that with the appointment setter. Sometimes, I need two appointment spots, so the team can stay on schedule. They’re always happy for that little bit of detail. It helps them make their other clients happy! That’s so thoughtful and a great tip, Jean. I’m sure they really appreciate the heads up. ? This is fantastic advice. I hate when I forget to bring my list of questions and after returning home I have to call with my forgotten question(s) and wait all day for a reply. Grrrr! Yes, I’ve been there too, Cathy. Luckily, our vet is great about follow up phone calls but I still make a list if I have several issues to cover. Great post. I don’t know why I never thought to keep a journal before. I always keep all their vet papers and whatnot in a folder together, but I should also make notes and stuff in there too. Thanks, Jackie. I still keep a folder with vet bills and receipts too and the journal helps bring the data on all those papers into one neat package and it’s useful to add my observations too. The journal is a great idea. I was really impressed with my vet recently when they forwarded my records to Leo’s eye specialist and cc’d me on the email. I couldn’t believe how detailed my vet’s notes were. He documented things I’d totally forgotten about. That’s awesome, you have a very caring and thorough vet and it’s so nice that he shared the records with you too. Oh boy, I would be lost without my lists!!!! LOL! With multiple dogs, there’s a lot to keep track of. Your sibes are lucky you’re so organized! ? Great post, Elaine – I live for making lists and taking notes, especially in cute little note books 🙂 The first vet we went to with our pups (back in Northern VA) was so awesome as she took the time to put together a hand-written summary of our visit while we were checking out. I still have each and every single one of them filed away in “Missy & Buzz’s” very own, big folder in my office. I always try to be as prepared as I can prior to going to the vet’s – and arriving on time should definitely be a no-brainer. Missy & Buzz are probably some of the weirdest pups out there as far as vet visits are concerned – they LOVE going because of all the attention they’re getting. Maybe it has something to do with the fact that their first human mommy who raised them for their first 8 weeks was a receptionist at our vet’s, and every single time she took the 9 puppies along for their shots they got showered with love & attention? Your first vet was so thoughtful to write those summaries for your records, how nice! Vet visits with Buzz and Missy must be pretty relaxed, that’s awesome! When we go, Haley’s the first one in the door, tail wagging then she suddenly remembers where she is, haha! She does okay though, a little nervous but she handles it well. I love this! I never thought about keeping a medical journal. Will implement that one PRONTO. I’m in the process of trying to find a new vet now, and it’s a bit over whelming, so your post was timely to say the least. Thank you. I hope Harley and Jax find a wonderful new vet there, it’s a good time to start the journal too. ? Great tips – especially #2 about using Dr. Google…not a good idea. Yes, Dr. Google can be pretty frightening. He always gives you the worst possible diagnosis, lol! ? This was such a great post, I wish more people would do this before there vet visit to our clinic. Thanks, JoAnn! You could probably add several more items to the list.